External columns – TRUTH IN MEDIA: TRUTH TRUMPS POWER EVERY TIME! “Stevan Niksic, a commentator on Nin magazine, thinks Mr Djindjic’s fling with the Bosnian Serbs represented opportunism rather than ideological nationalism. Since in Eastern Europe the word “liberal” still has its original, positive meaning (open-minded, tolerant of others), this writer tried to explain to some Serbian demonstration leaders why the above epithet about the alleged nihilism would actually be considered a COMPLIMENT in the liberal New World Order speak. The more faceless, drab, materialistic, corruptible… a person is, the better he/she is suited for a LEADERSHIP position within the globalist-style world order. By contrast, letis see how such a liberal nihilistic ideology might play with the Belgrade pro-democracy demonstrators. Here’s a mock “news report” about a fictitious speech by a fictitious Serbian opposition leader. Let’s call him – Levi Desnic (a ‘Lefty Rightwing’ in loose translation). Levi Desnic steps toward the microphone to address a crowd of several tens of thousands of Belgrade protesters. He pauses, he thumps himself on the chest and proudly declares: ‘I BELIEVE IN NOTHING!’ He pauses again. The crowd seems stunned. Some demonstrators can be seen pointing their index fingers to their heads, as people do when wondering if a person had gone mad. The crowd starts chuckling, evidently assuming Levi Desnic is building up to a joke. Now the crowd is roaring with laughter. ‘Levi-Nothing,’ ‘Levi-Nothing,’ some are chanting spontaneously, as if it were a sporting event is shutout score. ‘Do you think that Bill Clinton believes in nothing?’ Levi Desnic continues to test the demonstrators, as if lecturing at a university auditorium. ‘Daaaaa,’ the Belgrade crowd roars back. ‘Daaaaaaaaa,’ the crowd responds louder and longer. ‘Daaaaaaaaaaaaa,’ the crowd shouts back its longest and loudest approval. ‘And aren’t all these people respected leaders of the international community?’ Levi Desnic uses Logic 101 to set up the victory line. ‘Daaa,’ some in the crowd reply. Others are seen shaking their heads, as if realizing that maybe this was not a Levi Desnic comedy hour. A loud laughter forces Levi Desnic to pause. After everybody settles down, he continues. He pauses to allow the stirring crowd to settle down. ‘Levi-Nothing,’ ‘Levi-Nothing,’ some start to chant. ‘Kohlbright-Nothing,’ ‘Kohlbright-Nothing…’, other pick up the refrain. ‘I believe in the same thing Clinton believes in,’ Levi Desnic replies. Attribution: Djurdjevic is a Phoenix, Arizona-based writer and businessman. He writes about geopolitical and economic issues. Zoran Đinđić, the sixth Prime Minister of the Republic of Serbia, was assassinated on Wednesday, March 12, 2003, in Belgrade, Serbia. Đinđić was fatally shot by a sniper while exiting his vehicle outside of the back entrance of the Serbian government headquarters. Đinđić had made many enemies domestically throughout his political career primarily of because of his regard as being pro-Western and his hard-line policies on organized crime. Đinđić extradited Slobodan Milošević to the ICTY in 2001. There is nothing people like that would not do to appease and please their globalist masters. Because they believe in nothing. Except in power and money. America is rapidly becoming a nation of mutts. Our country’s traditional character is being systematically destroyed by nihilistic “liberals,” the New World Order’s centurions whose only God is the Almighty Dollar. The same kinds of people invented the “dictatorship of the proletariat,” and applied it to the unsuspecting Russians. Now, they are trying to ram a “dictatorship of the minorities” down the naive Americans’ throats. In its present form, America’s social demise is a more benign mutation of the “Bolshevik” revolution, perhaps the kind of a gradual change which the “Menshevik” communists would have preferred. Either way, the desecration of America the Beautiful is not a spontaneous event. Nor is a deliberate dumbing down of our nation. It is a multi-pronged process carried out by the Wall Street elite and their vassals in government, education, media and the entertainment industry. Why would the bankers and industrialists want America to be a nation of “ignorant blunderers or dunderheads,” according to Oxford Dictionary’s definition of “mutts?” Or a country of “mongrels, fools or muttonheads,” according to Webster’s? Because such a stupefied population is easier to subjugate by the elite’s financial shackles than would be the free-spirited, free-thinking, patriotic, enterprising Americans who had made this country the envy of the world. Sadly, knowledge and artistry are yielding to materialistic values in today’s America. “Money makes the world go around,” we are told by those who have it. Really? More likely, money is what will run the free world aground. If the Almighty Dollar does become everyone’s “God” (Heaven forbid! ), those with most of it will become autocratic emperors of the world. And that will spell the end of freedom and democracy for the rest of mankind. In preparation for such an ultimate enslaving of the free human spirit, a new, ugly, primitive, obedient America is being crafted by the NWO architects. As a first step, however, they must knock down the country’s Christian foundations. And even that figure (53 percent) understates the rapidly declining share of Americans of European descent, who for nearly two centuries had accounted for more than three-quarters of the American population. 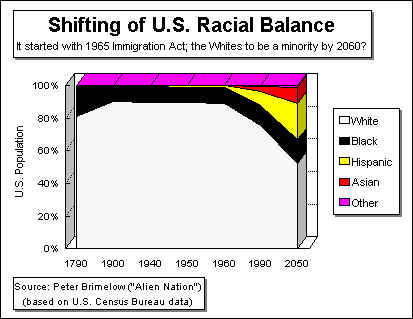 The U.S. Census Bureau, which made the above year 2050 projection, counts all immigrants from the Middle East and North Africa as “whites,” according to Mr. Brimelow. More than just creating an ethnic cauldron of arguably incompatible cultures which may boil over into violence one day, the U.S. 1965 Immigration Act has seriously eroded the quality of the American labor force. Why? Because in a free U.S. labor market, unskilled or less qualified immigrants can and do help lower the overall labor wages by merely competing with the indigenous Americans for jobs. The winners, of course, are the “Wall Streeters,” the top one percent of Americans who own 42 percent of America’s national wealth, according to Rep. David Obey, Wisconsin Democrat. The losers are the “Main Streeters,” the bottom 60 percent of Americans, who experienced an overall decline in their net worth during the 1980s. How things like that can happen if this country is really a democracy is something Americans and political scientists (an oxymoron!) should ponder. Once upon a time, America was a democracy. And white Americans exercised their majority power over other minorities, sometimes ruthlessly. Now the tables have turned. The corruption of the American political system by Wall Street’s and foreign money, and the “liberals” willingness to sell out true liberalism for a dictatorship of thought, are making the majority of Americans subjects of reverse discrimination. Take the term “politically correct” (PC), for example. It is fervently used by politicians and the establishment-owned media, and rigorously imposed on our children – from K-12 to colleges. Yet, being “PC” really is a “dictatorship of minorities.” The majority of Americans are not supposed to acknowledge this fact out loud, however – for fear of offending the minorities. Easy. They buy the politicians. They buy the educators. They buy the media. And then, they tell them what they want Americans to think. Or else. And suddenly, America is no longer free. At least the “political commissars” under communism operated openly. Everybody knew what they were – the moral whores (if not who they were), and what their job was. So freedom-loving people in communist countries used to discount or ignore anything the establishment media wrote. But here, in our supposedly “free” American society, we are much more vulnerable. We are taught to believe what we read or see on TV. The entertainment industry is another purveyor of the destructive forces which are tearing apart the traditional fabric of the American society. Just as the drugs are destroying the bodies of young Americans, Hollywood, the record companies and the professional sports owners and sponsors are poisoning the minds of America’s youth. Take violence, for example. “Thou shall not murder,” command the Christian scriptures. Yet, more people are probably killed in movies on America’s screens every day than had died in any day in this century’s wars. Is it any wonder, therefore, that America is one of the most dangerous places to live in the world? Or, take the music. The romantic serenity of the “classical” (Christian) composers, like Bach, Chopin, Mozart, Beethoven, Tchaikovsky, Dvorak, Liszt and others has been usurped by the pagan beat of rap or the heavy metal rock bands which dominate our airwaves. Finding a classical music radio station in America today is like counting hen’s teeth. Why? Why should we, the descendants of these great European musicians, be deprived of their fine art? “Because there is no money in it,” we are usually told. “And why is there no money in it?” Because the powers that be in today’s America have chosen not to put the money into Christian music! Instead, they have opted to invest their money into pagan music and violent movies. Or into gladiator-like sports, like football or basketball. Meet America’s role models, the superstar gladiators. An education system which can be reduced to games of chance has more in common with Las Vegas casinos and the New York stock market than it does with knowledge. No wonder our “bubble” generations tend to applaud on the same cues at talk shows; idolize the same heroes; dress the same; drink the same; talk the same; cuss the same; and, of course, think the same. The extent to which they vary from each other is merely in the choices they make between prepackaged answers served up by others – again as with the bubbles – rather than by coming up with their own, independent thoughts. As a result, we have raised several successive generations of morons in this country – well-dressed and often overfed, but intellectually impoverished. So after decades of letting them guess which bubbles to fill in, rather than reply to who, what, why, where and when questions, our educators have joined the process of dumbing down of America. But the biggest wreckers of America’s national fibers are the multinational companies. Loyal only to money, they call for free trade incessantly, and wear the national colors of the countries in which they do business merely as camouflage. The ideal world for these chameleons is a world of mutts, a cheap and not too smart labor force, willing to put the bosses’ materialistic ideology ahead of their national interests, their cultures, and their national pride. The U.S. is no exception. America used to be a country in which most people worshipped Jesus Christ, the son of God, who died on the Holy Cross. Now most Americans worship the Almighty Dollar, the son of Usury, the enslaver of Free Man, in shrines like Wall Street. But for their pin-striped suits, they might as well be the high-rolling Las Vegas gamblers. For, the stock market has long ago ceased to be the “barometer of economic activities,” as we were taught in schools, and as some Wall Street people still claim. In 1996, for example, U.S. companies have invested $170 billion into buybacks of their own shares, according to a Fortune magazine June 23 story. That’s more than 42 Albanian GDPs being squandered without creating a single job! And that’s legal in America? Today’s stock market is nothing more than a “Ponzi scheme,” according Dr. Michael Hudson, a respected economist, who heads up the Institute for the Study of Long-Term Economic Trends in New York. It is a means of siphoning off the money from wage-earners (retirement savings, social security funds, private investment accounts, mattresses), and transferring it into the pockets of financial institutions (banks and brokers). In addition, due to an accounting system peculiar to the banks, unlike ordinary taxpayers, the banks can set aside virtually all their savings before paying taxes, Dr. Hudson explains (by recording interest and other income as savings in a special category designated as reserves). It is yet another instrument for increasing the concentration of capital in the NWO elites’ pockets. But it does take gullible and greedy “mutts” to make that “Ponzi scheme” work. It will cease working, however, when the stock market crashes, or when the Baby Boomers start to cash their retirement checks en masse – whichever comes first. By then, many will find their retirement accounts depleted or empty, while the bankers (who will get out of the market early) ride off into the sunset with the workers’ savings. * More importantly, we must teach our children Christian values by lessons and examples AT HOME. And be prepared to pull them out of the public schools, if our local community insists on producing another generation of NWO morons. * Petition the state and federal representatives that, unless they work with us on re-establishing traditional American values, we will withhold our taxes. Not one taxpayers at a time, so that state authorities or the IRS/FBI agents can pick out individuals for persecution, but as whole communities. Suppose the residents of any Small Town USA decide to stage a “no more taxes” civic protest, akin to “no taxation without representation” rebellion of our Founding Fathers? If entire towns engaged in such a righteous civic disobedience, how many “towns” can the FBI could arrest? Let me tell you – none! The Feds would hightail out of your local community just as they did when Sheriff Dave Mattis, of Big Horn County, Wyoming, for example, declared in early August that he now has a written policy that forbids federal officials from entering his county and exercising authority over county residents unless he is notified first of their intentions. And that’s that! All it took was a one man stand. That could have been you… and you… and you… or I… making the stand. Or better still – all of us together. Unless we stand up and fight for “America the Beautiful” which our forefathers have passed on to us, we will deserve to be buried in “America the Ugly,” a nation of mutts, a country of “ignorant blunderers or dunderheads” into which the NWO wants to make us. A wonderful video.Thank you for sharing. The authors even used the title of my Aug 1997 Washington Times column “Dumbing Down of America” – http://wp.me/p3QU1S-1ST (the WT editors retitled it to DANCING ‘ROUND THE GOLDEN CALF).